Cairo City Hall is located at 1501 Washington Avenue, Cairo, IL 62914; phone: 618-734-4127. Photo: Magnolia Manor, ca. 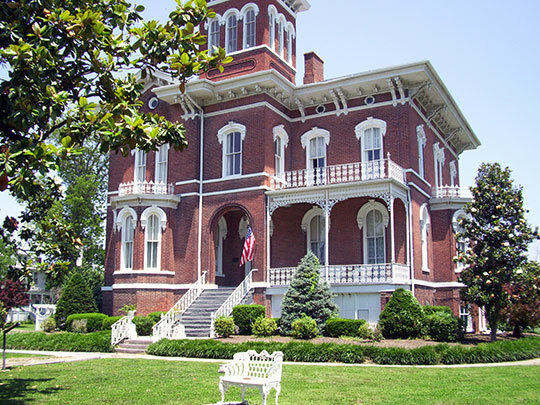 1869, 2700 Washington Avenue, Cairo, IL. Listed on the National Register of Historic Places in 1969. Photographed by User:User:MuZemike (own work), 2011, [cc-by-3.0 (creativecommons.org/licenses/by/3.0)], via Wikimedia Commons, accessed October, 2013. Cairo is located at the confluence of the Ohio and Mississippi Rivers. It is the southernmost town within the State of Illinois. Cairo was founded in 1837 by the Cairo City and Canal Company. It was incorporated as a city in 1858. The project of building a city that shall become a large commercial depot at the junction of the Ohio and Mississippi Rivers was entertained by a number of enterprising gentlemen as early as 1818. After an examination of most of the prominent locations on both rivers, this spot was selected and a very liberal charter was granted by the territorial government, with the style of the City and Bank of Cairo. The site was purchased of the general government and arrangements were in progress to commence operations. The sudden death of the "master spirit" of the enterprise, the embarrassments of the monied interests of the West, the decease of others, and the involvement of others, the project was delayed, if not abandoned. These early projectors certainly possessed foresight. By the great mass of community in east and west, their project was regarded as wild, visionary and impractical. In their advertisement published in 1818, the proprietors say things about the anticipated prosperity of the west, the growth of the country along the Mississippi, the extension of trade, the accumulation of the productions of agriculture, the growth of towns and cities, all of which then were regarded as visionary, if not insane, and yet all these have turned out in 20 years to be matter of fact. In January, 1836, the legislature incorporated the Illinois Central Railroad Company for constructing a railroad to commence at or near the confluence of the Ohio and Mississippi Rivers and terminating at Galena. After this company had organized and secured valuable lands in the vicinity of Cairo, the legislature passed the law for a general system of internal improvements by the State, and made this Central Railroad the great artery of the system. The construction of this road was relinquished to the State, the law having provided it should commence at the City of Cairo. This portion of the road is now under contract for 23 miles, and much of the heavy embankments are nearly completed. Efforts were made at the present session of the legislature to change the location of this road, and make the terminating point several miles further up the Ohio River. The legislature has decided against a removal, and before another session, the embankments, grading and bridging of this part of the road will be completed. The Cairo City and Canal Company, was incorporated in March, 1837, with special power to purchase any part or the whole of township seventeen, and more particularly the tract of land incorporated in 1818 as the City of Cairo, and to make all the improvements for the protection, health and prosperity of said city. The stock of this company is divided into 20,000 shares, of $100 each share, amounting to 2-million dollars. The stock has been taken, the company organized, the lands owned by the Central Railroad Company and others purchased, the obligation to construct a turnpike road leading to intersect the Vincennes and St. Louis turnpike road, and a loan procured by a Deed of Trust made with the "New York Life Insurance and Trust Company," equal to the most extensive investments and improvements authorized by their charter. Bankers in England, of immense wealth, have advanced funds for present purposes, and will advance further any amount required upon the security provided. One of the first steps of the Cairo City and Canal Company was to ascertain by actual survey the extreme height of water ever known to overflow every part of the located site of the City of Cairo, washing of the bank by action of the Mississippi and all other facts affecting the interests and objects of the company. They employed an experienced surveyor for this purpose, who, after careful examinations, found that a considerable portion of the tract lay from one to two feet above the highest water mark — that when the waters of the Ohio and Mississippi reach a certain height, the immense extent of country overflowed opposite and below the mouth of the Ohio, extending into Arkansas and Louisiana, prevents a further rise to any extent. Hence it was found that a levee of 5 feet would protect the city from all inundation. The plan of improvement contemplates a levee around the city — a canal from Cash River to pass down the center of the tract and unite both with the Mississippi and the Ohio near the point — and the erection of warehouses, wharves, and buildings for the purposes of residence and business. About 20 miles from the city, and on the railroad that is now being constructed, is an inexhaustible body of building stone. The soil is suitable for brick and the tract and the country adjacent furnishes immense quantities of timber, among which are large bodies of cypress. The company intends to prepare buildings for business purposes and dwellings for family use, of such description as will suit the taste and convenience of every person, principally of brick or stone at locations to which owners may desire to locate themselves in this new city. The most liberal provision is made for education; a fund adequate to all future wants of the inhabitants being secured by land and lots in the city. J. M. Peck of Rock Springs, Illinois, The Traveler's Directory for Illinois, 1839, J. H. Colton, publisher, New York.